(Jan 13): Singapore shares rose on Friday to their highest in more than 14 months on strong retail sales data, while most other Southeast Asian markets remained subdued after US President-elect Donald Trump failed to address his economic policy plans. MSCI's broadest index of Asia-Pacific shares outside Japan lost 0.1%, while the dollar was down and US bond yields eyed their longest run of weekly declines since July. "Markets are pretty choppy because there is still uncertainty related to how Trump is going to manoeuvre his economic policies," said Taye Shim, research head at KDB Daewoo Indonesia. Investors also shrugged off China trade data that showed imports slightly beat forecasts on strong demand for commodities. Singapore snapped two sessions of losses and gained 1.1% to end at its highest level since November 4, 2015 led by financials and industrials. "Singapore has been doing so badly for so long and the index is up now. Maybe because of some expectations that things may start to look better going forward, (in terms) of upcoming results," an analyst from Singapore said. The city-state's November total retail sales rose 1.1% from a year earlier on the back of strong sales of motor vehicles and a rise in medical goods and toiletries retailing, data showed on Friday. DBS Group Holdings Ltd gained 1.1%, while industrial conglomerate Jardine Matheson Holdings Ltd closed 1.6% higher. The Philippine index ended down 0.4% for a third straight session, dragged down by financials and consumer staples. Property developer SM Prime Holdings Inc was down 1.3% while LT Group Inc lost 2.7%. Thailand rebounded to close 0.4% higher, led by gains in consumer cyclicals and consumer staples. 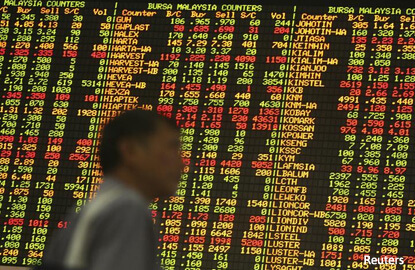 Indonesia ended 0.4 lower, its fifth straight session of losses, pulled down by basic materials and healthcare sectors. Malaysia and Vietnam ended 0.3% lower each.